Uglyworld #256 - Wage Makes A New Friend, originally uploaded by www.bazpics.com. 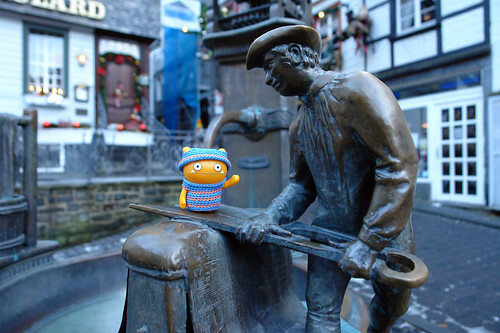 While exploring the village of Monschau Wage found himself a new friend who he wanted to introduce us all to. It turns out that the chaps name was Hans and he worked at the local textile mill where he could be found wringing the water out of the fabric after it had been soaked in the water pulled into the old mill from the river Rur. Hans was nice enough to stop his work for a few seconds so that Wage could have his picture taken with him (which Wage was over the moon about).